SPOTTED: letting agents stuffing flyers under flat doors, ‘to let’ boards all over the place and dodgy assurances that ‘all the good houses go quickly!’… There are plenty of myths about student housing in Southampton – here are a few of them busted. MYTH 1 – Everyone gets a house before January! 71.6% of students waited until the New Year to sign for a house! Well that’s just not true. In the Vent About Your Rent survey last year we asked students when they signed their housing contract – it turns out that a whopping 72% of students waited until the New Year to get their house. Get to know your friends before they become the housemate from hell. You’ve only known them since September, a few more months won’t hurt! Don’t be fooled into thinking that the big letting agents and their flashy advertising are your only option – private landlords can often have better quality houses, lower fees and more efficient service. In our survey the average rent charged per week by letting agents was £83.28, whereas private landlords charged an average of £75.82. By waiting you could bag yourself a cheaper, cleaner, better maintained house with housemates you actually get along with. What’s not to love?! MYTH 2 – All the good houses go first! Some letting agents release their housing stocks in stages to trick people into thinking there aren’t many houses left. Private landlords will often wait to advertise their houses or just rely on adverts in the window because they don’t have the budget to splash out on fancy marketing, thousands of flyers or ice cream carts (we all know who I’m talking about…). If good houses are the easiest to get students to rent then it pretty much guaranteed that the more difficult ones to shift (think mould, rats, missing ceilings, leaking showers) will be pushed first. A staggering 35.2% of students rated the quality of their house ‘bad’ or ‘very bad’. It’s going to be your home over the next year and a place where you sleep, study and socialise – it’s worth taking your time to make the right decision. The majority of students look round three or more houses before choosing which one to go for and 38% said that the condition of the house was the most important factor when deciding. MYTH 3 – I won’t have anywhere to live! Don’t panic. You will. Southampton has a surplus of student housing, so don’t be pressured into signing for a house you’re not satisfied with. Houses to let are advertised throughout the year, so it’s possible to find a house well after the Easter break. You might also be able to apply to live in Halls of Residence for another year (groups of friends can also do this! ), and the University will provide information about this later in the year. Facebook groups for house-hunting or even housemate-hunting, speedmating events and so much more going on means you definitely won’t miss out even if you don’t get hooked in by the first shiny flyer thrust under your nose. Tell your friends not to rush! Overhear your friend talking about getting a house? Your coursemates saying that all the good houses will be gone? Tell them not to panic. It’s so important that everyone realizes the cunning plan some more unscrupulous letting agents have to rush people into signing – so do your bit and let them know! Be skeptical of the claims made on flyers, spam emails or lettings boards. The stats show that people do get houses in the New Year, but also that it’s really easy for students to get caught out! If you see anyone flyering in halls or flyers put under your door then please let your halls reception know. If you’re on campus and see anyone wandering about advertising then give University Security a call (the number is on the back of your student card). Get involved in our campaign! We’ve got so much planned. From handy house-hunting tips to housing clinics to get your contract checked, you’ll get loads more information over the next few weeks and months that will make sure you know your rights before you sign a contract. If you do need any advice on anything to do with housing then please get in touch with The Advice Centre: from deposit disputes to lazy landlords they will be able to help! Or come and find me in the Sabb Office on Level 2 of Building 42! 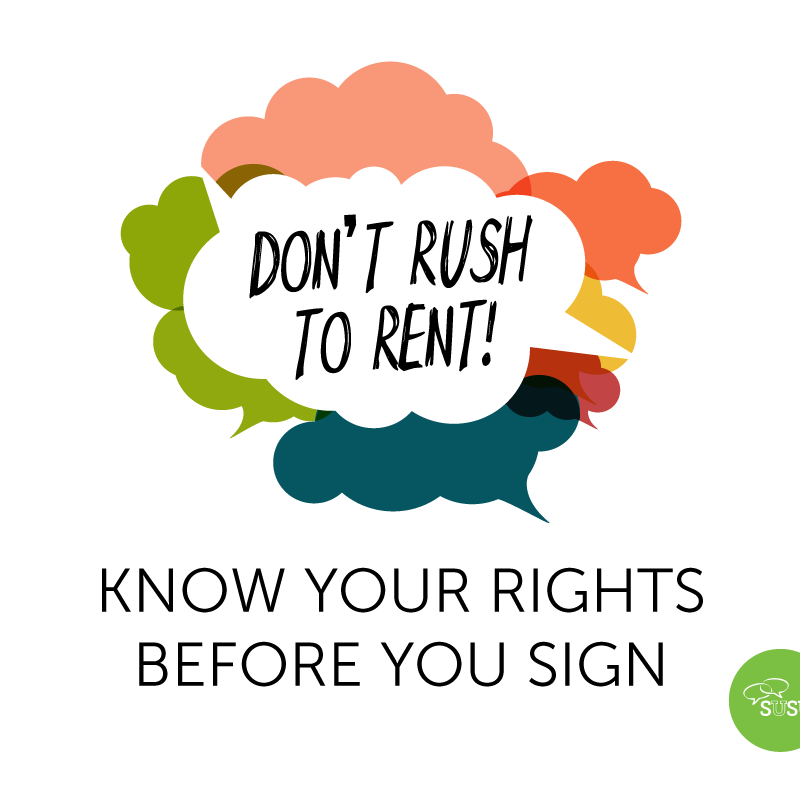 No Comments on "Don’t Rush to Rent – know your rights before you sign"
« Sabb Blog Takeover 4: Global Entrepreneurship Week 2015! !